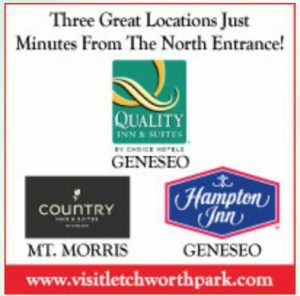 There are 28 trails through Letchworth State Park, ranging from a half mile to over 21 miles, and having easy to moderate difficulty. Moderate trails have some steep slopes The down-loadable park maps show the trail locations. Trail 5, Lee’s Landing – .5 mile, easy; Trail 6, Portage – .5 mile, easy; Trail 6A, Footbridge -.5 mile, moderate; Trail 7, Genesee Valley -5.75 miles, easy; Trail 8, River Road – 2.75 miles, easy; Trail 8A, Blue Jay Road – .5 mile, easy; Trail 9, Dish Mill Creek – 3 miles, moderate; Trail 10, Big Bend Road – 3.5 miles, easy; Trail 10A, Trillium – .5 mile, easy.